This semester, I will be giving a course at Mannheim University on the use of the internet in digital tools in political communication. This is the first time I’ll be giving this course, so I’m very excited to see how it goes. Here is the syllabus. As always, feedback is welcome. Digital services have become a common element in political campaigns. Still, the effects of the growing adoption of digital tools and the internet on political communication are far from certain. Public debate oscillates between the expectation of a significant transformation of the political sphere and claims to the internet’s insignificance. While academic debate is more nuanced, it is far from offering a consensus on the effects of digital services and the internet on politics. Over the course of the seminar, we will discuss key-texts addressing the role of digital services and the internet in political communication. We will focus on people’s use of digital services to gather information and comment on politics, the use of digital services by politicians and candidates, and in collective action. Basbøll, T. Research as a Second Language. Chadwick, A. 2006. Internet Politics: States, Citizens, and New Communication Technologies. Oxford, UK et al. : Oxford University Press. Chadwick, A. & P. N. Howard (Eds.). 2009. The Routledge Handbook of Internet Politics. New York, NY et al. : Routledge. Jungherr, A. & H. Schoen. 2013. Das Internet in Wahlkämpfen: Konzepte, Wirkungen und Kampagnenfunktionen. Wiesbaden, DE: Springer VS.
Perloff, R. M. 2014. The Dynamics of Political Communication: Media and Politics in a Digital Age. New York, NY: Routledge. Reynolds, G. 2012. Presentation Zen: Simple Ideas on Presentation Design and Delivery. 2. ed. Berkeley, CA: New Riders. Stromer-Galley, J. 2014. Presidential Campaigning in the Internet Age. Oxford, UK: Oxford University Press. Jungherr, A. & H. Schoen. 2013. “Technische Entwicklung und gesellschaftliche Erwartungen: Eine kurze politische Ideengeschichte des Internets”. 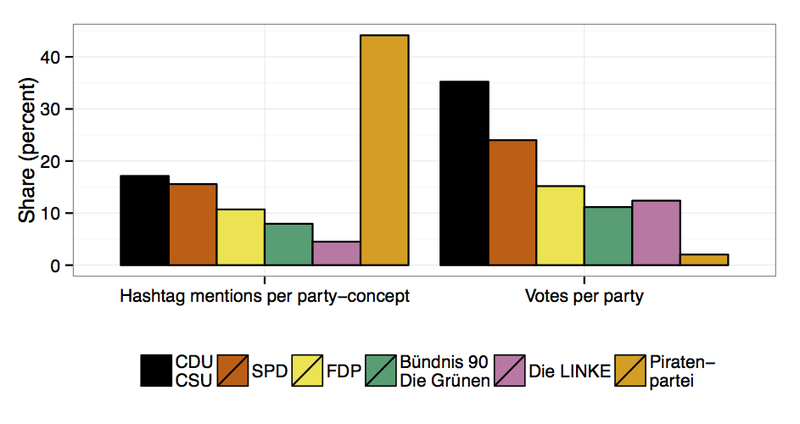 Das Internet in Wahlkämpfen: Konzepte, Wirkungen und Kampagnenfunktionen, 11-35. Wiesbaden, DE: Springer VS.
Abbate, J. 1999. Inventing the Internet. Cambridge, MA: The MIT Press. Isaacson, W. 2014. “Ch 7: The Internet” & “Ch 10: Online” & “Ch 11: The Web”. The Innovators: How a Group of Hackers, Geniuses, and Geeks Created the Digital Revolution, 217-262 & 383-404 & 405-466. New York, NY et al. : Simon & Schuster. Turner, F. 2006. From Counterculture to Cyberculture: Stewart Brand, the Whole Earth Network, and the Rise of Digital Utopianism. Chicago, IL et al. : The University of Chicago Press. Neuman, W. R., B. Bimber & M. Hindman. 2011. “The Internet and Four Dimensions of Citizenship”. In: The Oxford Handbook of American Public Opinion and the Media, Eds. R. Y. Shapiro & L. R. Jacobs, 22-42. Oxford, UK et al. : Oxford University Press. Benkler, Y. 2006. The Wealth of Networks: How Social Production Transforms Markets and Freedom. New Haven, CT et al. : Yale University Press. Wilhelm, A. G. 2000. Democracy in the Digital Age: Challenges to Political Life in Cyberspace. New York, NY et al. : Routledge. Freelon, D. 2010. “Analyzing online political discussion using three models of democratic communication”. New Media & Society 12(7): 1172-1190. Karpf, D. 2011. “Open Source Political Community Development: A Five Stage Adoption Process”. Journal of Information Technology & Politics 8(3): 323-345. Kreiss, D., M. Finn & F. Turner. 2010. “The limits of peer production: Some reminders from Max Weber for the network society”. New Media & Society 13(2): 243-259. Farrell, H. 2012. “The Consequences of the Internet for Politics.” Annual Review of Political Science 15: 35-52. McPherson, M., L. Smith-Lovin & J. M. Cook. 2001. “Birds of a Feather: Homophily in Social Networks”. Annual Review of Sociology 27: 415-444. Garrett, R. K. 2009. “Politically motivated reinforcement seeking: Reframing the selective exposure debate”. Journal of Communication 59(4): 676-699. Gentzkow, M. & J. M. Shapiro. 2011. “Ideological Segregation Online and Offline”. The Quarterly Journal of Economics 126: 1799-1839. Farrell, H. & D. W. Drezner. 2008. “The Power and Politics of Blogs”. Public Choice 134(1-2): 15-30. Tewksbury, D. & J. Rittenberger. 2012. News on the Internet: Information and Citizenship in the 21st Century. Oxford, UK et al. : Oxford University Press. Karpf, D. 2010. “Macaca Moments Reconsidered: Electoral Panopticon or Netroots Mobilization?” Journal of Information Technology & Politics 7(2-3): 143-162. Lawrence, E., J. Sides & H. Farrell. 2010. “Self-Segregation or Deliberation? Blog Readership, Participation, and Polarization in American Politics.” Perspectives on Politics 8(1): 141-157. Hindman, M. 2005. “The Real Lessons of Howard Dean: Reflections on the First Digital Campaign”. Perspectives on Politics 3(1): 121-128. Bimber, B. 2003. Information and American Democracy: Technology in the Evolution of Political Power. Cambridge, MA: Cambridge University Press. Karpf, D. 2012. “Ch 1: The New Generation of Political Advocacy Groups” & “Ch 7: Innovation Edges, Advocacy Inflation, and Sedimentary Organizations”. The MoveOn Effect: The Unexpected Transformation of American Political Advocacy, 3-21 & 156-172. Oxford, UK, et al. : Oxford University Press. Nielsen, R. K. 2011. “Mundane Internet Tools, Mobilizing Practices, and the Coproduction of Citizenship in Political Campaigns.” New Media & Society 13(5): 755-771. Kreiss, D. 2012. “Acting in the Public Sphere: The 2008 Obama Campaign’s Strategic Use of New Media to Shape Narratives of the Presidential Race.” Media, Movements, and Political Change 33: 195-223. Alexander, J.C. 2010. The Performance of Politics: Obama’s Victory and the Democratic Struggle for Power. Oxford, UK et al. : Oxford University Press. Chadwick, A. 2013. “Symphonic Consonance in Campaign Communication: Reinterpreting Obama for America”. The Hybrid Media System: Politics and Power, 113-136. Oxford, UK et al. : Oxford University Press. Stromer-Galley, J. 2000. “On-Line Interaction and Why Candidates Avoid it”. Journal of Communication 50(4): 111-132. Kreiss, D. 2011. “Open Source as Practice and Ideology: The Origin of Howard Dean’s Innovations in Electoral Politics.” Journal of Information Technology & Politics 8(3): 367-382. Kreiss, D. 2014. 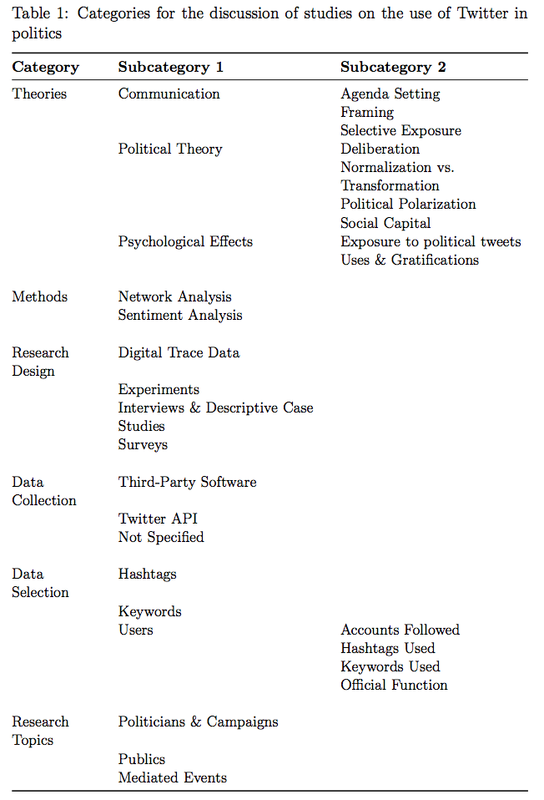 “Seizing the Moment: The Presidential Campaigns’ Use of Twitter During the 2012 Electoral Cycle”. New Media & Society (Online First). Stromer-Galley, J. & A. B. Baker. 2006. “Joy and Sorrow of Interactivity on the Campaign Trail: Blogs in the Primary Campaign of Howard Dean.” In: The Internet Election: Perspectives on the Web in Campaign 2004, Eds. A. P. Williams & J. C. Tedesco. Lanham, MD et al. : Rowman & Littlefield Publishers. Kreiss, D. 2012. “Ch 5: Organisation the Obama Campaign”. Taking Our Country Back: The Crafting of Networked Politics from Howard Dean to Barack Obama, 121-154. Oxford, UK et al. : Oxford University Press. McKenna, E. & Han, H. 2015. Groundbreakers: How Obama’s 2.2 Million Volunteers Transformed Campaigning in America. Oxford, UK: Oxford University Press. Nielsen, R. K. 2012. Ground Wars: Personalized Communication in Political Campaigns. Princeton, NJ: Princeton University Press. Stromer-Galley, J. 2014. “Ch 5: 2008: Networked Campaigning and Controlled Interactivity”. Presidential Campaigning in the Internet Age, 104-139. Oxford, UK: Oxford University Press. Cogburn, D. L. & F. K. Espinoza-Vasquez. 2011. “From Networked Nominee to Networked Nation: Examining the Impact of Web 2.0 and Social Media on Political Participation and Civic Engagement in the 2008 Obama Campaign”. Journal of Political Marketing 10(1-2): 189-213. Enos, R. D. & E. D. Hersh. 2014. “Party Activists as Campaign Advertisers: The Ground Campaign as a Principal-Agent Problem”. American Political Science Review (Forthcoming). Nielsen, R. K. 2009. “The Labors of Internet-Assisted Activism: Overcommunication, Miscommunication, and Communicative Overload”. Journal of Information Technology & Politics 6(3): 267-280. Stromer-Galley, J. 2014. “Ch 6: 2012: Data-Driven Networked Campaigning”. Presidential Campaigning in the Internet Age, 140-170. Oxford, UK: Oxford University Press. Howard, P. N. 2006. New Media Campaigns and the Managed Citizen. New York, NY: Cambridge University Press. Issenberg, S. 2012. The Victory Lab: The Secret Science of Winning Campaigns. New York, NY: Broadway Books. Issenberg, S. 2014. “How the Democrats Can Avoid Going Down This November: The new science of Democratic survival”. New Republic (April 27). Madrigal, A. C. 2012. “When the Nerds Go Marching In”. The Atlantic (November 16). Sides, J. & L. Vavreck. 2014. “Obama’s Not-So-Big Data”. Pacific Standard (January 21). Enos, R. D. & A. Fowler. The Effects of Large-Scale Campaigns on Voter Turnout: Evidence from 400 Million Voter Contacts. (Working Paper). Hersh, E. D. & B. F. Schaffner. 2013. “Targeted Campaign Appeals and the Value of Ambiguity”. The Journal of Politics 75(2): 520-534. Nickerson, D. W & T. Rogers. 2014. “Political Campaigns and Big Data”. Journal of Economic Perspectives 28(2): 51– 74. Chadwick, A. 2013. “Ch 3: The Contemporary Context of Hybridity”. The Hybrid Media System: Politics and Power, 42-59. Oxford, UK et al. : Oxford University Press. Chadwick, A. 2013. The Hybrid Media System: Politics and Power. Oxford, UK et al. : Oxford University Press. Chadwick, A. 2011. “Britain’s First Live Televised Party Leaders’ Debate: From the News Cycle to the Political Information Cycle”. Parliamentary Affairs 64(1): 24-44. Jungherr, A. 2014. “The logic of political coverage on Twitter: Temporal dynamics and content.” Journal of Communication 64(2): 239-259. Trilling, D. 2014. “Two Different Debates? Investigating the Relationship Between a Political Debate on TV and Simultaneous Comments on Twitter”. Social Science Computer Review (Online First). Bennett, W. L. & A. Segerberg. 2012. “The Logic of Connective Action: Digital Media and the Personalization of Contentious Politics.” Information, Communication & Society 15(5): 739-768. Bennett, W. L. & A. Segerberg. 2013. The Logic of Connective Action: Digital Media and the Personalization of Contentious Politics. Cambridge, MA et al. : Cambridge University Press. Bimber, B., A. J. Flanagin & C. Stohl. 2012. Collective Action in Organizations: Interaction and Engagement in an Era of Technological Change. Cambridge, MA et al. : Cambridge University Press. Howard, P. N. & M. Hussain. 2013. Democracy’s Fourth Wave? Digital Media and the Arab Spring. New York, NY et al. : Oxford University Press. Hussain, M. M. & P. N. Howard. 2013. “What Best Explains Successful Protest Cascades? ICTs and the Fuzzy Causes of the Arab Spring.” International Studies Review (15)1: 48-66. Jungherr, A. & P. Jürgens. 2014. “Through a glass, darkly: tactical support and symbolic association in Twitter messages commenting on Stuttgart 21.” Social Science Computer Review 32(1): 74-89. Tufekci, Z. & C. Wilson. 2012. “Social Media and the Decision to Participate in Political Protest: Observations From Tahrir Square”. Journal of Communication 62(2): 363-379. Karpf, D. 2012. “Social science research methods in internet time”. Information, Communication & Society 15(5): 639–661. Cioffi-Revilla, C. 2014. Introduction to Computational Social Science: Principles and Applications. Heidelberg, DE et al. : Springer. Cioffi-Revilla, C. 2010. “Computational social science”. Wiley Interdisciplinary Reviews: Computational Statistics 2(3): 259–271. Freelon, D. 2014. “On the Interpretation of Digital Trace Data in Communication and Social Computing Research”. Journal of Broadcasting & Electronic Media 58(1): 59-75. Rogers, R. 2010. “Internet Research: The Question of Method”. Journal of Information Technology and Politics 7(2-3): 241-260. Vor einigen Tagen sprach ich auf der Tagung „Medienkonvergenz im Bundestagswahlkampf 2013“ in Mainz zur Rolle des Internets in den Kampagnen der Parteien zum Bundestagswahlkampf 2013. Inzwischen sind Videoaufzeichnungen aller Vorträge online. Die Vorträge waren besonders spannend, da die Organisatoren eine interessante Mischung aus Wahlkampfpraktikern, Journalisten und Wissenschaftlern eingeladen hatten, so dass die Tagung ihr Thema aus unterschiedlichster Perspektive illustrieren konnte. Anbei meine 5 Cent zum Thema.